Discover peaceful apartment home living in Tampa, Florida at Eagles Point Apartments at Tampa Palms. With spacious one, two and three bedroom apartment homes featuring a variety of well-appointed floor plans each with either a balcony or patio, Eagles Point will surely have an apartment that is right for you. Come enjoy our recently renovated clubhouse, pool, fitness center, and play room! Set on professionally-maintained, landscaped grounds, our pet-friendly community is conveniently located just minutes from the University of South Florida and close to the best in dining, shopping and entertainment. In addition, we fall within the prestigious Tampa Palms School District (Tampa Palms Elementary School, Liberty Middle School, and Freedom High School). 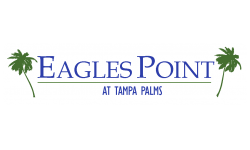 Visit Eagles Point Apartments at Tampa Palms in Tampa, Florida today!